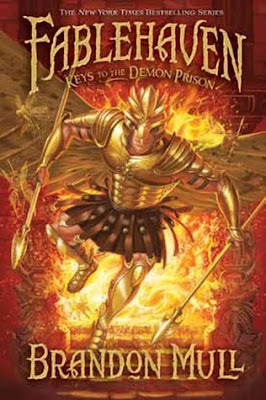 This is the final book in the Fablehaven series by Brandon Mull. I wish I could do more to spread the word about how great these books are! It's too bad they didn't get the marketing that Harry Potter or Twilight did - they could have, and they deserve to have, become much more well known. The idea behind the series - magical or mythical creatures have fled to preserves or reservations, as the normal world has stopped believing in them, and these preserves each have a caretaker. The youth characters in these books are the grandkids of a caretaker, and get involved in fighting a conspiracy to let demons out of prison that would destroy the world. The storyline is unique, the characters are believable, the fantasy world in it is different enough from anything else I've read, that I have to give the author full credit for his creativity. As the last book in the series, this book does not disappoint. It starts out fast, and keeps going the whole time, with twists and turns and all sorts of fun stuff. I liked the ending too - it leaves me wanting more, but wraps up the story of the books nicely. The audiobooks - the first five minutes or so I get a little bugged by the reader - slightly too diminuitive in his pronunciation and intonation. I quickly get used to it though, and he does a great job with the different voices and stuff. This series is a personal and family favorite - right up there, a very close 2nd to Harry Potter. Nice work, Brandon Mull!